What a fabulous transformation and surprise Peter Andre, Linda Barker and the 60 Minute Makeover Team gave to Grandpa Ronald, with a little help from his lovely grand-daughters! Last Friday, ITV aired the episode of 60 Minute Makeover in which the team went to St Helen’s in Merseyside to give cherished grandfather, Ronald, the surprise of his life. In just a day, the team transformed Ronald’s beige and bland Dining Room and Living Room into a stylish and contemporary living space, using the theme Linda Barker had chosen of a “Gentlemen’s Club”. Grandpa Ronald's Curva Extending Dining Table all set to go! 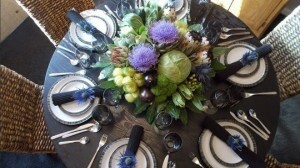 from a round table into a fabulous oval table which can accommodate the whole family. Ronald and his family were absolutely over the moon, and we hope they all really enjoy using it. 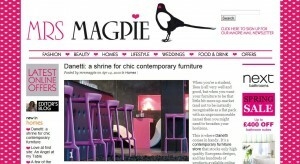 Kelly Hoppen Features Our Bar Stools on TV Show Again! This week, Kelly Hoppen prescribed Danetti Bar Stools once again for her client on her TV Show, Superior Interiors on Channel 5. When Kirat Nandra, decided she'd had enough of the eye-popping bright orange colour scheme in her one bedroom London flat, she called upon world reknowned interior designer, Kelly Hoppen to design her a "grown up" living space for her new "girl about town" persona. With a budget of £20,000, Kelly set about blanking out all signs of the multi coloured decor that made the flat appear even smaller, and creating a calm and tasteful living room and open plan kitchen area. Using tones of cream and Kirat's "dreaded taupe", Kelly specified contemporary and multi-functional furniture, including some funky Rondure Leather Bar Stools from Danetti. After a few ups and downs, the bijou London flat was transformed just in time for a delighted Kirat to hold a house-warming party for her friends. We were also delighted Kelly suggested Danetti Bar Stools in Episode 2 of Superior Interiors for the Applebaum family. We always like to champion our commercial customers, large or small. We love being able to help them create stylish and functional interiors and will happily showcase the end result on our blog. We've just caught up with a recent client of ours, Andy, who runs Champers wine bar in Eastcote Middlesex. He did a partial refurbishment of Champers using Danetti furniture, with sofas, chairs and bar stools in a combination of mulberry and cream upholstery, and says that the result is chic and sophisticated. "We didn't want to do a full refurb, just an update - we kept the same bar and flooring, so we wanted new furniture to give the place a new look. "We chose the mulberry and cream colour scheme to compliment the Farrow & Ball paint we were using on the walls, and the result is a sophisticated interior, which we've had very positive feedback on from our regulars. "We think the Danetti furniture definitely creates a good first impression at Champers, which is really important to us." If you want to check out the new furniture at Champers, or enjoy a cocktail or a bottle of wine and some live music (which is probably more likely, if we're honest), then you can find out more about the place here, or visit them at 184 Field End Road, Eastcote. We'll try to get a few pictures of Champers on our blog in the near future. Every now and then we like to draw your attention to one of our more unusual products. And this is one product we think you'll want to know about. The Arima sofa has been designed by Tokujin Yoshioka, an incredibly talented contemporary designer who was an apprentice to Shiro Kuramata and Issey Miyake before setting up on his own in 2000. He’s behind the Issey Miyake shop in Tokyo, and has also designed exhibition space for Miyake, Hermès, Muji and Peugeot. 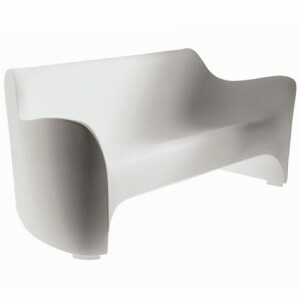 Now you can have a piece of his designer furniture in your own home or commercial space, with this Arima sofa. It's got a polyethylene moulded body and can be used both inside and outdoors. Be prepared for design aficionados to heap praise on your design choice. 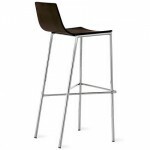 Danetti’s Stylish Coco A Frame Bar Stool’s in Clarins! We at Danetti are proud to be supplying Clarins with bar stool seating for their Roadshow. They chose our Coco A Frame Bar Stool as it is a perfect, modern and stylish piece of seating that compliments their brand. The strong steel frame is finished in a highly polished chrome, and Clarins opted for a classic black seat to compliment their set up, although we have a variety of different colours available for this stool. Whilst the stool looks great, the seat of the Coco A Frame Bar Stool provides a comfortable curved wrap-around surface that supports the lower back. Making it a perfect solution for Clarins clientÃ¨le on the Roadshow. You will also find the following products in this popular range : Coco Bar Stool, Coco A Frame Chair, Coco Flat Chair and Coco Classic Chair. If your heading to your local newsagent this week for your copy of Real Homes Magazine (March 2008 Edition), don't forget to have look in the Style for Less section (pg 18-19), to see our Cubilux Chair in Red Leather featured. 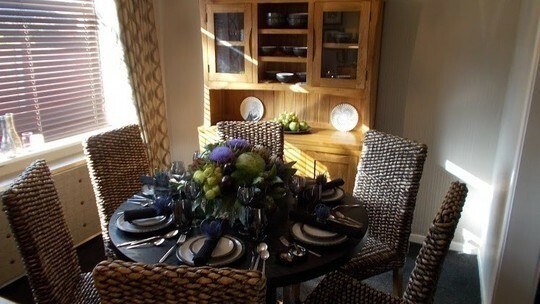 Part of the Beautiful Basics range of furniture, it really is a stand alone designer piece for the home. Incredibly comfortable with a thick cushioned seat, back and arms, the Cubilux is not only a great seat to relax into, but it also promotes better posture with a straight low back. The quality real leather and highly polished chrome finishes mean the Cubilux really does have the whole package. The Cubilux Chair is available in black and red leather. Click here for more information about the Cubilux Leather Chair.